The messenger’s bike was chained to a green lamppost. 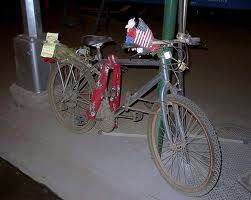 Red, white and blue plastic roses and an American flag stuck into the grey dust on its handlebars, it stood waiting patiently for its owner to return. He never did. The bike had become a symbol of the thousands of innocent lives thrown away. 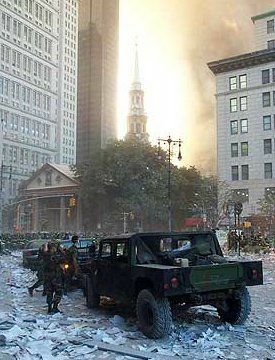 It’s my most haunting memory of 9/11. That and the stench, acrid and lingering, the smell of burning concrete, which still permeated downtown Manhattan a month after the horror. 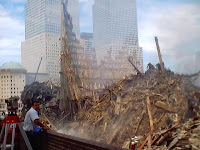 Down in the hellhole behind the hoardings, the remains of the twin towers were piled like a huge smoking bonfire, many stories high. Out of them, two iconic metal structures, like the ruined facades of a huge cathedral, pointed towards the sky. How men worked in those scalding, foul conditions, I'll never know, but the searching never ceased: it would be another six months before all the debris, human and architectural, was removed. 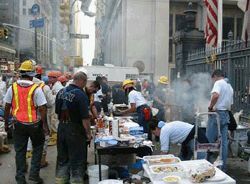 On the streets of Lower Manhattan, there was the most haunting, sobering atmosphere. Locals, workers, visitors like me, everyone walked silently with shocked respect. The only sound was the relentless pounding and whirring of the machines and cranes down in the rubble below. Sometimes, all too infrequently, they too were muted – as another body, or part of a body, was released from its dust-covered tomb and firemen and workers stopped to pay their respects. We all knew the world had changed forever: this was the human side of the devastation. 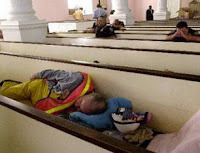 St Paul’s Church, a few yards from the epicentre of the disaster, or “ground zero” as the news operations had called it, had become a place of refuge and recuperation. Workers slept in the pews, food was sent it by local restaurants, pedicures and massages were offered for worn limbs or burnt feet. I watched exhausted firemen queuing for coffee and comfort. 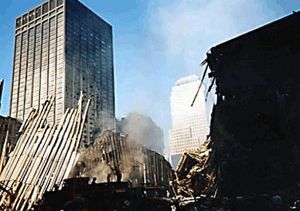 By night, back in the clean luxury of my hotel room in Union Square, I looked across the 30 or so blocks to the floodlights where the twin towers had been, unable to get the terrible images of September 11th out of my mind. It was one of those seminal moments, like the death of Princess Diana. Right now, television networks are full of recollections, repeats and re-enactments. Of course this is an event the world must never be allowed to forget, but we should beware lest overfamiliarity weakens the shock of those terrible images; the live television pictures that day were the most appalling the world has ever seen. We watched the world change in high-definition clarity, thanks to a perfect blue sky over a smogless morning. Everyone remembers where they were: I was in my London office, on the phone to Jane Root, one of the BBC’s Controllers, when the second plane hit. A pause, and then “Oh my God”, we said in unison, and Jane added “I’d better go” as she rushed off to cancel her programme schedule. I remember the fear and the rumours in my office: would London be next? I came to New York a month later because ABC had asked us to make a Christmas special for them. Challenge America, it was called, based on the British show. Erin Brockovitch became Anneka, but we needed a project. The problem was where to start: there was so much devastation, yet most workers in the city were still digging for bodies at Ground Zero. So we restored a little theatre close by and threw a party for the children of the victims. It was the first building project in the city since the disaster, and Mayor Giuliani came to launch it. But it was just a tiny drop in the ocean, and seemed an inadequate response to the enormity of the problem. We mended their theatre, but the looks on the faces of the children showed that it would take so much more than a television programme to rebuild their lives, so cruelly destroyed on that horrible day. I just book-marked you! I love your blog. Thanks Crystal, I'm flattered. Feel free to tell your friends!